Before Jumping into the interesting facts about the respiratory system, let me give you a short intro on what is a respiratory system, its role in your overall health, how to take care of this organ, etc. Do not skip this part. It will take only a minute but will give you the value worth a million. Read on. The respiratory system is an umbrella term that covers organs and structures responsible our body’s most important process “Breathing”. 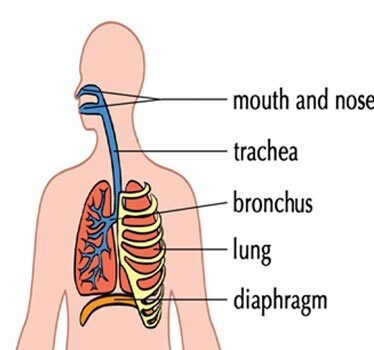 Organs that make up the respiratory system are Lungs, Trachea, Bronchus and Diaphragm. The primary responsibility of Lungs is none other than the gas exchange (inhaling oxygen and exhaling Carbon dioxide). The Trachea is also called as the windpipe. The Bronchus carries air directly into lungs using trachea(two air tubes). The diaphragm is the place where the process of breathing starts. It is possible to live with Just one lung. Although it limits your physical ability, it will not stop you from leading a normal life. In fact, many people in the world are living with just one lung. When we breathe we take only 21% of Oxygen. We lose weight while breathing. Every day, we lose about 12 oz of water through respiration. Don’t you think it as one of the most interesting facts about the respiratory system? While exhaling carbon dioxide, we exhale water as well. Humans at rest, exhale up to 17.5 milliliters of water per hour. You can lose about four times the amount with exercises. Breathing is all about Carbon Dioxide! We all have an entirely wrong conception about breathing. Shame on our old school sciences. On the contrary to the popular belief, oxygen plays only a little role in breathing. Through every breath, we take half a litre of air that contains 21% of oxygen but our body requires only 5%. So tell me now, what breathing is all about? If each alveoli from both of our lungs are flattened out, they will come to the total size of a tennis court (525 feet long). The maximum amount of time one can hold his/her breath is only 30 to 60 seconds. But there are some people who can hold their breath up to 20 minutes. They all had a rigorous training to attain this control. So never attempt to take up this test without proper It can lead to death or a severe brain damage. While adults breath only 12 to 15 times per minute, newborns (45 days or one and half months )take a breath for 30 to 60 times per minute. When something is not right, a switch occurs at the nostrils to exchange their work. Usually, right nostril will seem predominant during the daytime, and the left nostril will appear paramount during the night time. You can sense this shift around the dawn or at the time of sunset. The lungs are the only organs in our body that can float in water. Both of our Lungs have 300 million balloons like structures that are known with a name alveoli. In the blood stream, it performs the work of replacing Co2 with oxygen. When those structures are filled with air, our lungs create an illusion of floating in the water. 200 different viruses can be reason for common cold. Though “rhinovirus” plays a vital role in developing the common cold, actually we can get common cold and flu from 200 different types of viruses that include “human coronavirus & the respiratory syncytial virus”. In U.S alone common cold affects more than 1 billion people every year. Next most interesting fact about respiratory system may flatten you. Hyperventilation triggers the production of acid (responsible for digestion) in our body. As it leads to quick digestion, you will feel hungrier than usual. The Cohesion of lungs & windpipe was understood right at the time of ancient Egyptian Civilization. Lungs & windpipe should work together so that they can fill the tissues and cells with oxygen. This rule is the same for both humans and animals. People of ancient Egypt known this fact before the days of scans and x-rays. To depict this cohesion they had developed a hieroglyph such that the organs “lungs and windpipe attached to each other”. In order to remind the necessity of unity among the upper and lower classes of Egyptians, this hieroglyph was often printed on the artefacts’ belonging to pharaohs (people who ruled the lands). Children who breathe directly from mouth will likely to develop a lisp while talking. The human nose has four stages of the filtration The hairs inside the nose help filtering the unwanted things from entering the lungs. When we breathe through the mouth, the air directly gets into stage 4 by surpassing all 3 stages. It results in tonsillitis, ear infections, respiratory tract infections and sore throat. Breathing through mouth results in the bladder shrinkage that creates an urge to urinate in the middle of the night. In order to balance the breath between each of the nostrils, our body will automatically change sides for every 30 minutes. Horses breathe only with their noses. For humans and other animals breathing through mouth occur naturally. The Windpipe process in three ways, when the air travels through nose and enters into the nasal passage, i.e., the windpipe the air is been filtered, moistened, and heated. And there is a thin layer of tissue called epiglottis, which is covered by the windpipe in order to prevent from entering food and other liquids into it. The windpipe stays open while taking a breath and closes automatically while swallowing food. If you are very careful, just around sunrise and sunset, you will witness a slow shift from right to left nostril, or left to the right nostril. You can move a day without water or food. But definitely not without breathing. It is the reason there has always been a huge emphasis given to breathing in the traditional practices like Yoga, Pranayama and Meditation. Because of our fast, hurry bury life, most of us forget to pay attention on how we breathe moment by moment and day by day. As a result, we induce some irreparable damages t our body and so, our lives. Practice breathing exercises, adopt clean and healthy habits and keep your respiratory system healthy. Share these interesting facts about the respiratory system with the people you care and let them know all these facts that hide behind their breathing. How To Cleanse Your Body From The Maggi Toxins?